Lung cancer is the second most common cancer in both men and women in the UK. More than 46,000 people are diagnosed with lung cancer each year. Most cases of lung cancer are caused by smoking. You may develop lung cancer if cells in your lungs grow in an uncontrolled way. The cells usually form a lump or tumour. Your lungs move oxygen from the air you breathe into your blood and remove carbon dioxide as you breathe out. They’re made up of lots of air tubes (called bronchioles) and air sacs (called alveoli). You have different types of cell in the different parts of your lungs. This means you can get different types of lung cancer. When a tumour starts in your lung, this is called primary lung cancer. Sometimes cancer spreads to your lungs through your bloodstream or immune system from another part of your body, such as your kidney, breast or prostate. This is called secondary cancer. There are two main types of cancer that start in the lung (primary lung cancer). These are called non-small cell lung cancer (NSCLC) and small cell lung cancer (SCLC). These names come from how the cancer cells look under a microscope. Nearly nine in every 10 primary lung cancers are NSCLC. There are three main types of NSCLC. They’re all different, but doctors tend to group them together because they’re treated in a similar way. Adenocarcinoma mainly affects the outer part of your lungs. This is the most common type of lung cancer. Between four and five in 10 people with NSCLC has adenocarcinoma. It’s usually related to smoking, but it’s also the type of lung cancer you’re most likely to get if you’re a non-smoker. Squamous cell carcinoma affects your main airways (your bronchi), usually near the centre of your lungs. Between two and three in 10 people with NSCLC will have this type of lung cancer. Large cell carcinoma can occur in any part of your lungs. It affects one in every 10 people with NSCLC. Between one and two in 10 people with lung cancer has SCLC. SCLC can develop quickly and spread to other parts of your body early on, often before it’s been diagnosed. This makes SCLC particularly difficult to treat. SCLC is almost always caused by smoking. Many symptoms of lung cancer, such as a cough, can also be symptoms of other much less serious conditions, such as asthma. But if you’ve had symptoms such as a cough or feeling very tired for longer than three weeks, contact your GP surgery for advice. Some of the more serious symptoms above – such as increasing shortness of breath, chest pain and coughing blood – should be checked by a GP sooner rather than waiting three weeks. If you’re in any doubt, it’s best to see you GP as soon as you can. A persistent cough can be a symptom of a much less serious lung condition, such as asthma or a simple viral infection. But it’s important to speak to your GP surgery if you’ve had a cough for over three weeks or you’re worried about any other symptoms. Your GP will ask you about your symptoms and medical history and whether or not you smoke. They may ask you to wait and see if your symptoms get better on their own, particularly if you’re younger and haven’t smoked. This is most likely if your cough started when you had a cold or flu and you have no other symptoms. Your GP may prescribe a treatment such as antihistamines or an inhaler, to see whether your symptoms are caused by an allergy or asthma. The first test that’s normally done for lung cancer is a chest X-ray. Your GP will refer you for an X-ray if they think your symptoms could be caused by lung cancer. You may have an urgent referral if you’re over 40, or you smoke, or have done in the past. If your chest X-ray shows signs of lung cancer, your GP will refer you to a doctor who specialises in chest disease. If your GP is particularly worried about your symptoms, they may refer you even if your X-ray seems normal, or before you have any X-rays. Alternatively, in some cases, they may arrange for you to have a computer tomography (CT) scan (see below). The specialist will ask you to have various tests to confirm whether or not you have lung cancer. If it is cancer, the tests can also show which type of cancer you have, how advanced it is and whether it’s spread. This is called cancer staging. Tests you may have include the following. A CT scan of your chest and abdomen (tummy). This uses X-rays to make three-dimensional (3D) images of part of your body. This is usually the first test you’ll have after an X-ray. A PET-CT (positron emission tomography) scan. This is a special form of CT scan that you may be offered if you have early-stage cancer. It helps doctors to see areas where there might be cancer and to show if the cancer has spread. A bronchoscopy. This test lets your doctor look inside your lungs and remove a sample of tissue (a biopsy). A bronchoscope is a narrow, tube-like telescopic camera. You’ll be given some anaesthetic spray and medicine to make you sleepy before the doctor passes the bronchoscope down your windpipe into your lungs. A needle biopsy through the skin of your chest wall. This is called a percutaneous transthoracic needle biopsy. It might be the best way to reach your cancer to get a sample of tissue (biopsy) if your cancer is in the outer part of your lung. Your doctor will numb your skin then insert a fine needle through it. They may use an ultrasound or CT scanner to guide the needle into the right place. How your lung cancer is treated depends on which type of cancer you have, how far it’s spread and your general health. Lung cancer can be difficult to cure because it may have already spread by the time you’re diagnosed. It may be possible to cure some types of non-small cell lung cancer (NSCLC) with surgery, if it’s at an early-stage and hasn’t spread. If it isn’t possible to cure your cancer, your treatment will aim to extend your life and improve your quality of life as much as possible. This is called palliative care. Non-small cell lung cancer (NSCLC) that has not spread is usually treated with surgery first. This may be followed by chemotherapy. If the cancer has already spread, treatments such as chemotherapy or immunotherapy may be offered first. 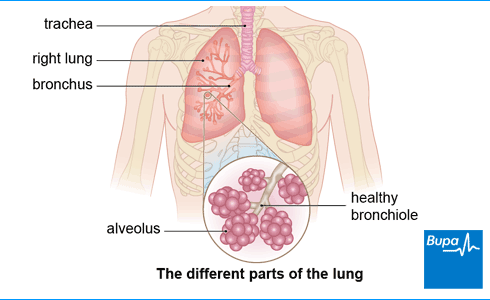 Small cell lung cancer (SCLC) is usually treated with chemotherapy rather than surgery. This is because the cancer has often spread by the time it’s diagnosed. Chemotherapy for SCLC is sometimes combined with radiotherapy. Or, if the cancer is more advanced, you may be offered chemotherapy first and radiotherapy later. Your doctor will discuss all of your treatment options with you. They’ll also advise you to stop smoking, as this will help to reduce the side-effects of your treatment. Stopping smoking may also mean your cancer is less likely to come back after treatment. Surgery is usually the first treatment for NSCLC if it hasn’t spread. Your surgeon may remove a small section, part of one lung or a whole lung, depending on the size, type and position of your cancer. Whether or not you are offered surgery also depends on how healthy your lungs are to start with. Some NSCLC can be cured with surgery. Surgery isn’t normally recommended for most cases of SCLC. But it may be possible for people with early stages of this type of lung cancer. If you’re going to have surgery, stopping smoking before your operation will help you recover better afterwards. Before surgery, you may be given some advice on how to get yourself as fit as possible so you’re ready for your operation. Radiotherapy uses radiation to destroy cancer cells. Your doctor will target a beam of radiation onto the area of your lung with the cancer to shrink the tumour. You may have radiotherapy if you have NSCLC but you aren’t well enough for surgery. You may also have radiotherapy with chemotherapy, especially if you have SCLC. Chemotherapy uses medicines to destroy cancer cells. It’s the treatment you’re most likely to be offered if you have SCLC but it may also be used in NSCLC. You may have chemotherapy on its own, after surgery or with radiotherapy. Chemotherapy is usually given as an injection or through a drip. Targeted therapies are medicines that can block messages in your cancer cells to stop them growing and dividing. They’re also called biological therapies. You may be offered targeted therapy if you have a particular type of NSCLC. Immunotherapy is a newer type of cancer treatment, which helps the body's immune system to attack cancer cells. There are a number of immunotherapy drugs now available to treat advanced NSCLC, which you may be offered, depending on certain features of your cancer. All lung cancer treatments can help to manage your cancer, but they can also cause side-effects. Your doctors and nurses will give you information about the treatments. This will help you decide which treatment is right for you and what to expect. Everyone is different and the effects of the treatments vary from person to person. Smoking is the biggest cause of lung cancer, causing at least eight in 10 cases. Your risk of lung cancer is related to how much you smoke, how long you’ve been smoking and when you started smoking. It also depends on which type of cigarettes you smoke. Smoking unfiltered cigarettes and high nicotine cigarettes gives you the greatest risk of developing lung cancer. Passive or second-hand smoking (breathing in other people’s smoke) is also linked to the disease. The most important thing you can do to reduce your risk of developing lung cancer is to stop smoking. Speak to your local pharmacist or GP about the best ways to give up smoking. Using nicotine replacement therapy (such as gums or patches) can help you quit. Vaping is also considered safer than smoking and may be an option for you to consider, although quitting completely is still best. Try to avoid second-hand smoke – keep away from enclosed spaces where other people are smoking. Try to avoid exposing yourself to anything at work that could increase your risk of lung cancer, such as asbestos or radiation. There’s some evidence that eating fruits and vegetables can help to reduce your risk of getting lung cancer if you’ve never smoked. So try to eat a balanced diet with at least five portions of fruit and vegetables every day. Taking dietary supplements doesn’t seem to have any effect on the risk of lung cancer and may even be harmful. Being more physically active may help to reduce your chance of getting several cancers. Being diagnosed with cancer can be distressing for you and your family. An important part of cancer treatment is getting enough support to deal with the emotional aspects as well as the physical symptoms. Your doctors and nurses will help to support you through your treatment. They can prescribe medicines and offer practical advice to deal with symptoms you may be experiencing, such as pain, exhaustion, breathlessness, coughing, anxiety and depression. Your hospital should also offer a range of helpful services, including dietitians, counsellors, complementary therapists and benefits advisers. Lots of therapies can be useful, including art, music, drama and relaxation. Voluntary groups and patient organisations, such as Macmillan nurses and Marie Curie nursing and day centres, are also available. It’s important to share your feelings and talk about any worries you have. Your specialist cancer doctors and nurses are experts in providing the support you need and may also visit you at home. You should have a key worker assigned to you as soon as you’ve been diagnosed. If you can, take a friend or family member with you to your hospital appointments. Make sure you understand the pros and cons of every treatment and that you’re in charge of making your own decisions. Don’t rush into making a decision until you’re sure about it. Encourage your family and close friends to get support and talk about their feelings too. Caring for someone with cancer can be very stressful. If you have more advanced cancer, you can get support through hospices or at home. Your doctor will discuss this with you. How can I find out about new lung cancer treatments? How can I find out about new lung cancer treatments? You may hear or read about new cancer treatments in the news, but many of these are still in the experimental stages, rather than being available to patients. If you do read any media reports of new treatments, discuss these with your cancer specialist. Then you’ll know whether or not they’re suitable and available. New treatments for lung cancer are constantly being developed and tested in clinical trials. All new treatments need to go through several clinical trials before they can be used on everyone. Each clinical trial will recruit a certain number of patients to take part. In a randomised controlled trial, patients and doctors don’t know who has been given the new treatment. Some clinical trials compare new or existing treatments with other treatments to check they’re safe and to see which ones work best. Other trials look at new ways of giving treatments or look at how treatments can help someone’s quality of life. Each clinical trial has strict guidelines about who can take part. This may mean they’re looking for people with a certain type of cancer, of a certain age or at a particular stage in their illness. You can ask your doctor or at the hospital where you’re being treated if there are any local clinical trials. But if you want to join a trial, you’ll need to be referred by your cancer specialist. They’ll know whether you’re right for the trial and whether the treatment being trialled could be right for you. You can find out more about clinical trials happening near you on the Cancer Research UK website. What is hospice care? What is hospice care? If your cancer can't be cured, hospices can play an important role in providing support for you and your family. They tend to be comfortable and homely – smaller and quieter than a hospital. They aim to look after you as a whole person and support those who care for you. The doctors and nurses in a hospice can give you specialist care for any symptoms from advanced cancer. These may include pain and breathing problems. You may not need full-time hospice care. You may only need to visit a hospice once a week for support or advice, or for a few days to get your symptoms under control. Your GP may be able to arrange a short stay in a hospice for you to give your carers a break. Hospices may also offer you and your family and friends a range of additional support. This includes counselling on how to cope with your cancer as well as practical advice, such as about money, equipment and services. They may also be able to help you and your family so you can cope better at home. Your GP or specialist cancer nurse can tell you about hospices in your local area. How active can I be after lung cancer surgery? How active can I be after lung cancer surgery? It's important that you try to get yourself fit again as soon as possible after your lung cancer surgery. But it’s normal to feel tired for several weeks or even months afterwards so you’ll need to build up gradually. Keeping active after surgery may help your recovery. Walking is a good form of exercise to start with. The nurses and physiotherapists in the hospital will encourage you to be up and walking a little as soon as possible after your surgery. Before you leave the hospital, ask your doctor or physiotherapist how much exercise you should try to aim to do. At first, it's important that you take it slowly and don't do too much. Space out your activities during the day and listen to what your body is telling you. Do a bit more each day and rest when you need to. Walk around the house at first and then build up to going outside. Remember that each person is different – ask your doctor or physiotherapist to provide an exercise plan that’s best for you.